That’s right. 5,000 pounds of hot glass. 2,100 degrees. ONE COOL SPOT. Welcome to Simon Pearce Mill and Restaurant, where we met Claire and Nate. She went to Maryland’s Salisbury University (where you can actually major in glassblowing) and has been blowing here for about a year. He’s been here 11 years, and since he’s gotten so good at stemware, has decided to stay. 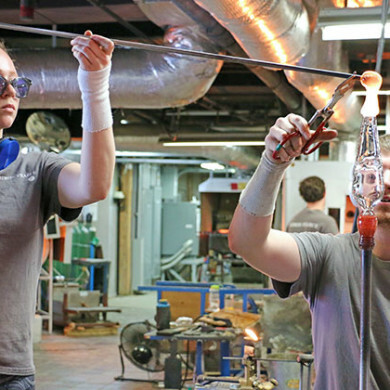 They like to blow glass after hours for fun. Once an item is complete, the artist has only about 30 seconds to get it to the furnace before it’s ruined. At this pace, they can make about 50-55 stems per day. They tell us if you know how to make stemware, you can make just about anything. But can you make a Band-Aid? The blowers tell us they burn themselves literally every day. Fun fact: the entire studio, including the furnace and leer, runs 24/7 off energy produced by turbine from the waterfall just outside. At a cost savings of around $20,000 per month, location was a key reason Pearce settled here. The mill offers glassblowing demonstrations and unique items for sale, while the restaurant has wonderful food and an inviting atmosphere. Simon Pearce Mill & Restaurant is located at 1760 Quechee Main Street in Quechee, VT. To learn more about its namesake’s interesting story, visit the Simon Pearce website or call (802) 295-2711.